Paul Axelrod is Professor of Social Science and History at York University. He is the author of Scholars and Dollars: Politics, Economics, and the Universities of Ontario, 1945-1980 (Toronto: University of Toronto Press, 1982), and Making a Middle Class: Student Life in English Canada during the Thirties (Montreal and Kingston: McGill-Queen's University Press, 1990). Axelrod, Paul. 1995. “Higher Education in Canada and the United States: Exploring the Roots of Difference”. 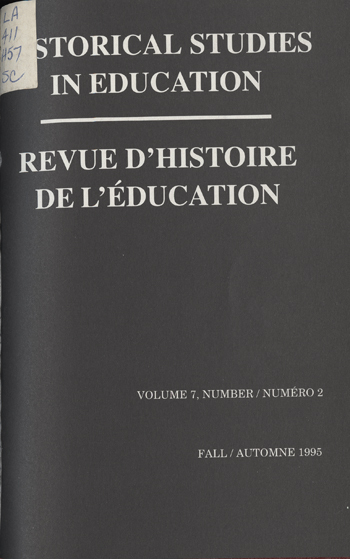 Historical Studies in Education / Revue D’histoire De L’éducation 7 (2), 141-75. https://historicalstudiesineducation.ca/index.php/edu_hse-rhe/article/view/1396.